The first time I saw the Roma of turkish origins from Eforie Sud was in October 2013, when I found the group under the open sky in the midst of a storm alert. Almost a year later, I saw some of them again living in containers at the edge of a rubbish dump. A large number didn’t have Eforie Sud identity cards, not because they didn’t need them but because the town hall has refused them this right for more than twenty years. And so they still live in the same hovels, with the daily fear that they will be thrown into the street like animals. In the summer months they survive from one day to the next, the same as they have for decades, peddling on the beach the therapeutical mud they collect from the Techirghiol lake nearby. They collect this mud in drums, strain it through a curtain to cleanse it of impurities, pour it into plastic bottles, which they gather from the streets and then sell for 2 lei a bottle. They don’t have a business plan nor do they raise their prices depending on demand – they simply sell enough to be able to put food on the table that day. They are constantly harassed by local police, and the amount of the fines they receive is thousands of times greater than what they earn from the bottles they sell. They have the right to an identity card, but they do not receive one. They have the right to suitable housing, but all they get, if they are not thrown into the street, is a metal container at the edge of a rubbish dump. It seems unbelievable that such abuses can take place in a European country in 2014, but they apparently can. God forbid that anybody put forward a law to protect vulnerable communities. How can you think about the future if you’ve been living for decades under threat of eviction? How can you send your kids to school when you have nothing to put on the table for them or when you don’t even know whether they will still have a roof over their heads at the end of the school day? Putting a stop to abusive evictions, in conjunction with a plan for economic self-sufficiency, would accelerate the process of emancipating and integrating these communities. Why should we accept the destruction of lives and pay millions of euros to CEDO instead of solving the problem by granting these people the right to use the land on which they have lived most of their lives, for let’s say forty-nine years and giving them as well the chance to buy it? 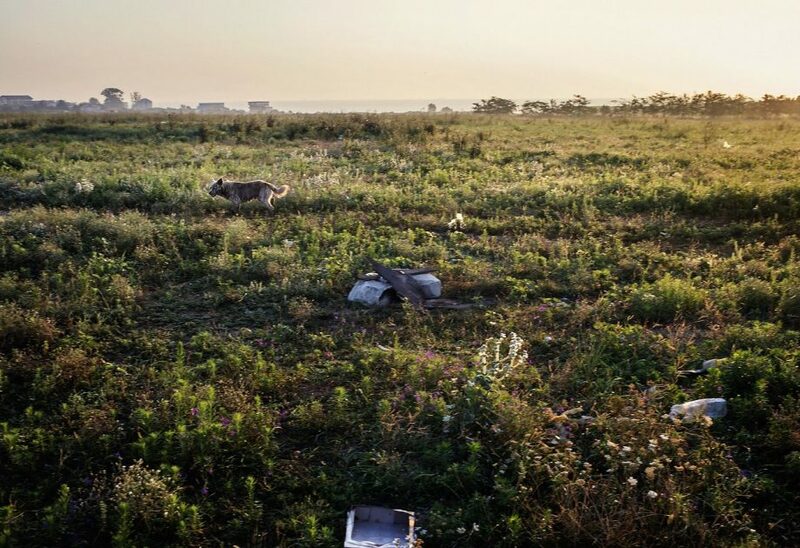 Dog passes by the place where a Roma community were given accommodation in metal containers, as seen near a new garbage dumpster in Eforie Sud on July 28, 2014. Regardless international pressure to stop such practices, local authorities continue to forcibly evict the remaining Roma people, one year after the initial displacement. On Friday 27, 2013, local authorities in Eforie Sud proceeded to forcibly evict more than 100 turkish Roma people, leaving almost 60 children, mostly under 10 with no shelter, facing extreme weather conditions and lack of food. 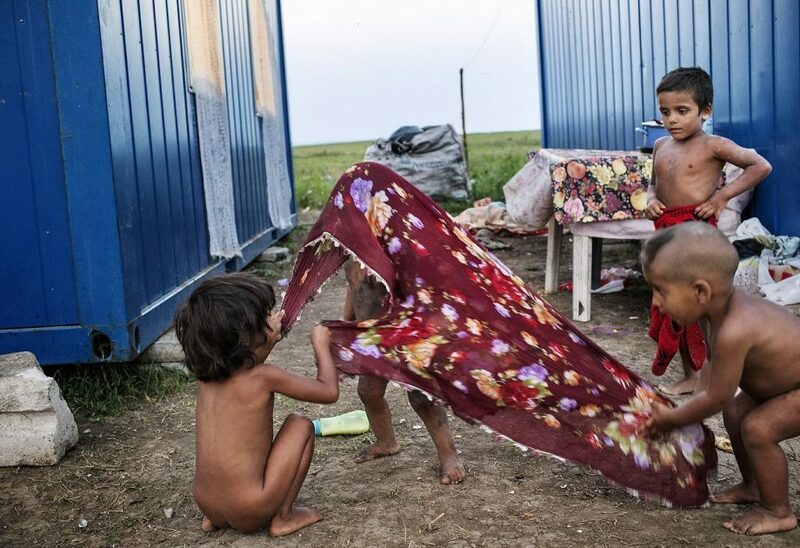 Roma kids of Turkis origins playing with a colored headdress in a Roma community given accommodation in metal containers, as seen near a new garbage dumpster in Eforie Sud on July 29, 2014. Regardless international pressure to stop such practices, local authorities continue to forcibly evict the remaining Roma people, one year after the initial displacement. On Friday 27, 2013, local authorities in Eforie Sud proceeded to forcibly evict more than 100 turkish Roma people, leaving almost 60 children, mostly under 10 with no shelter, facing extreme weather conditions and lack of food. 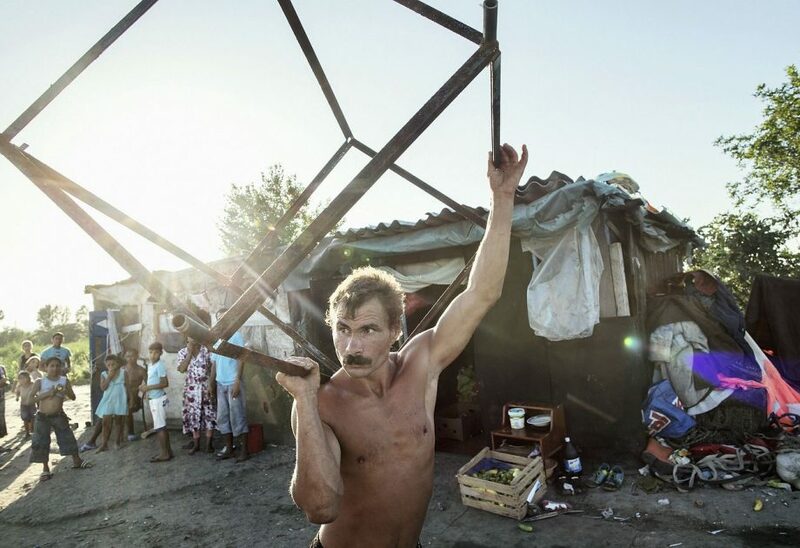 Roma man gathering scrap metal was denied ID papers and proper accommodation by the mayor of Eforie Sud, as seen near Agricola Street on July 31, 2014. Regardless international pressure to stop such practices, local authorities continue to forcibly evict the remaining Roma people, one year after the initial displacement. On Friday 27, 2013, local authorities in Eforie Sud proceeded to forcibly evict more than 100 turkish Roma people, leaving almost 60 children, mostly under 10 with no shelter, facing extreme weather conditions and lack of food.